Tonight’s Menu: On this rewind, Dave Sellers joins us as we share our thoughts about Star Trek VII: Generations. In 2293, Captain James T. Kirk (William Shatner), Montgomery Scott (James Doohan) and Pavel Chekov (Walter Koenig) attend the maiden voyage of the USS Enterprise-B under the command of the unseasoned Captain John Harriman (Alan Ruck). During the voyage, the Enterprise is pressed into a rescue mission to save two El-Aurian transport ships from an unknown energy ribbon. The Enterprise is able to save some of the El-Aurian refugees before their ships are destroyed, but the starship becomes trapped in the ribbon. Kirk goes to deflector control to alter the deflector dish, allowing the Enterprise to escape, but the trailing edge of the ribbon rakes across the starship’s hull, exposing the section Kirk is into space; he is presumed dead. In 2371, the crew of the USS Enterprise-D celebrates the promotion of the Klingon Worf (Michael Dorn) to Lieutenant Commander. Captain Jean-Luc Picard (Patrick Stewart) receives a message that his brother and nephew were killed in a fire, meaning the storied Picard family line will end with him. The Enterprise receives a distress call from an observatory in orbit around the star Amargosa, where they rescue the El-Aurian scientist Dr. Tolian Soran (Malcolm McDowell). The android Data (Brent Spiner) and Chief Engineer Geordi La Forge (LeVar Burton) discover a compound called trilithium in a hidden room of the observatory. Soran appears, knocks La Forge unconscious and launches a trilithium solar probe at Amargosa. The probe causes the star to implode, sending a shock wave toward the observatory. Soran and La Forge are transported away by a Klingon Bird-of-Prey belonging to the Duras sisters, Lursa and B’Etor, who had stolen the trilithium for Soran in exchange for a trilithium weapon. Data is rescued just before the observatory is destroyed by the shock wave. The Enterprise bartender hostess, Guinan (Whoopi Goldberg), informs Captain Picard more about Soran; they were among the El-Aurian refugees rescued by the Enterprise-B. Guinan explains that Soran is obsessed with reentering the Nexus, an extra-dimensional realm where time has no meaning and anyone can experience whatever they desire. Picard and Data determine that unable to fly a ship into the ribbon on account of the uncertainty that the ship will survive long enough to ensure his success, Soran is instead altering the path of the ribbon by destroying stars, and that he will attempt to reenter the Nexus on Veridian III by destroying its sun – and, by extension, a heavily populated planet in the system. Upon entering the Veridian system, The Enterprise makes contact with the Klingon Bird-of-Prey. Picard offers himself to the Duras sisters in exchange for La Forge, but insists that he be transported to Soran’s location first. La Forge is returned to the Enterprise and collapses, but by accident reveals the starship’s shield frequency, allowing the Duras sisters to inflict crippling damage to the ship. The Enterprise destroys the Bird-of-Prey, but has sustained irreversible damage to the ship’s warp core. Commander William Riker (Jonathan Frakes) orders an evacuation to the forward saucer section of the ship which separates from the stardrive. The shock wave from the stardrive’s explosion sends the saucer crashing to the surface of Veridian III. Picard attempts to reason with Soran out of his plan, but to no avail, and is too late to stop him from launching his missile. The collapse of the Veridian star alters the course of the energy ribbon as predicted, and it sweeps Picard and Soran away while the shock wave from the star obliterates everything in the system. In the Nexus, Picard finds himself surrounded by the family he never had, including a wife and children, but realizes it is an illusion. He is confronted by an echo of Guinan (from 78 years earlier). After being told that he may leave whenever he chooses and go wherever and whenever he wishes, Guinan sends him to meet Kirk, also safe in the Nexus. 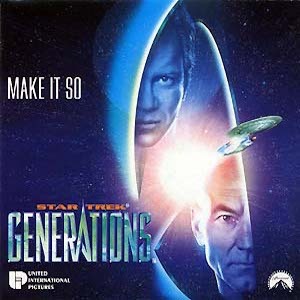 Though Kirk is at first reluctant to leave, Picard convinces Kirk to return to Picard’s present and stop Soran by assuring him that it will fulfill his desire to make a difference. Leaving the Nexus, the two arrive on Veridian III minutes before Soran launches the missile. Kirk distracts Soran long enough for Picard to lock the missile in place, causing it to explode on the launchpad and kill Soran. Kirk is mortally injured by a fall during the encounter; as he dies, Picard assures him that he made a difference. Picard buries Kirk on a hillside before a shuttle arrives to transport him to the wreckage of the Enterprise saucer. Three Federation starships enter orbit to retrieve the Enterprise survivors, but the ship herself cannot be salvaged. As Riker laments that he will never sit in the Captain’s chair of the ship, Picard muses that given the name’s legacy, this won’t be the last ship to carry the name Enterprise.